The following free books use EViews to provide step-by-step instructions on how to use EViews, generate tables, graphs, and offer examples on the application of EViews. Please download for your reference. Richard Startz (2015). 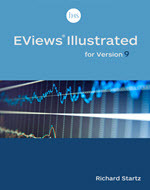 EViews Illustrated is a step-by-step user's guide to EViews. This book is filled with examples, step-by-step instructions, and screen-shot images that illustrates EViews’ different features and capabilities. Both new and experienced EViews users will find this book useful. Sam Ouliaris, Adrian Pagan and Jorge Restrepo (2016). 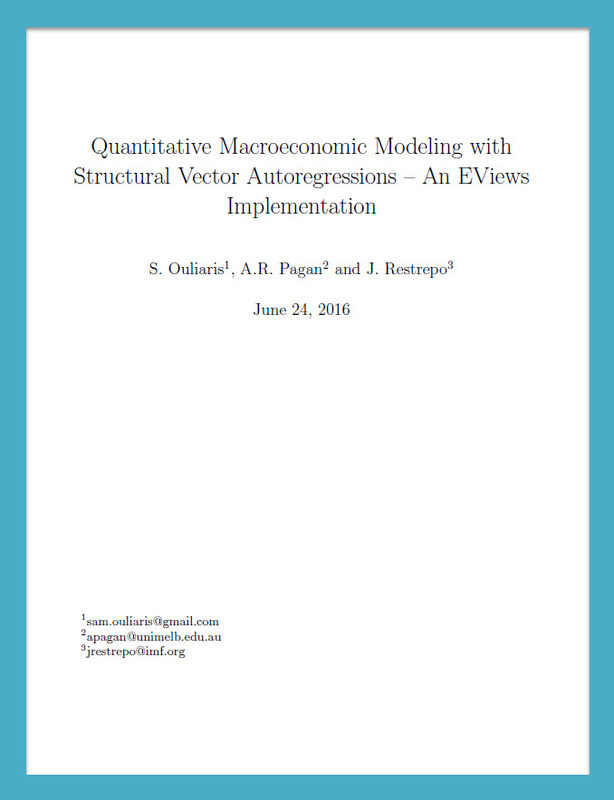 Quantitative Macroeconomic Modeling with Structural Vector Autoregressions. This book sets out the theory underlying the SVAR methodology in a relatively simple way and discusses many of the problems that can arise when using the technique. Jean-Louis Brillet (2011). 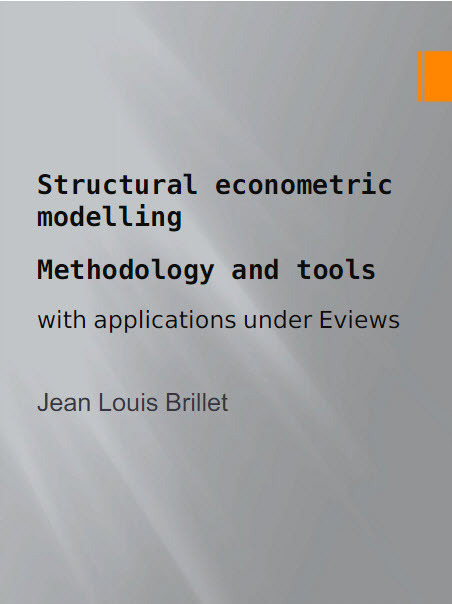 Structural econometric modelling: Methodology and tools with applications under EViews describes how to use the model object in EViews to solve structural economic models. 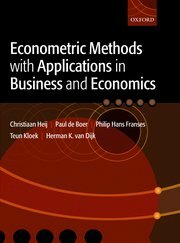 This book provides step-by-step examples of using EViews for modelling and easy to follow descriptions of economic modelling theory and its applications. The following textbooks use EViews examples as a teaching tool. They are available bundled with the EViews 7 or 6 Student Version. Diebold, Francis X. (2007). Elements of Forecasting, 4th Edition, with EViews 6 Student Version software. Thomson/South-Western (458 pages - ISBN: 0-324-32359-X, http://www.thomsonedu.com. The following textbooks use EViews examples as a teaching tool. They are available bundled with the EViews 4.1 Student Version. Gujarati, Damodar N. (2006). 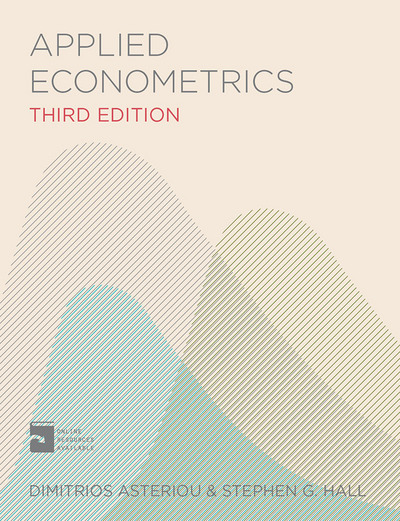 Essentials of Econometrics, 3rd Edition, with EViews 4.1 Student Version software. McGraw-Hill Higher Education Publishing (553 pages - Book ISBN: 0-072-97092-8, EViews Package ISBN: 0-073-13851-7, http://www.mhhe.com/economics/gujaratiess3. Schmidt, Stephen J. (2005). 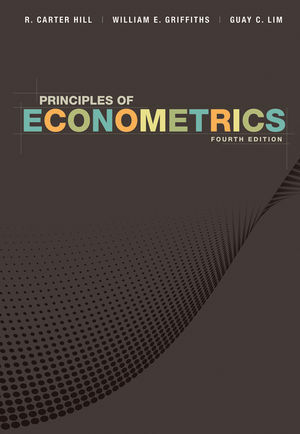 Econometrics, with EViews 4.1 Student Version software. McGraw-Hill Higher Education Publishing (427 pages - Book ISBN: 0-079-98316-7, Book+EViews Package ISBN: 0-074-25489-8). Gujarati, Damodar N. (2004). Basic Econometrics, 4th Edition, with EViews 4.1 Student Version software. McGraw-Hill Higher Education Publishing (1002 pages - Book ISBN: 0-072-56570-5, EViews Package ISBN: 0-072-47852-7)http://www.mhhe.com/economics/gujarati4). 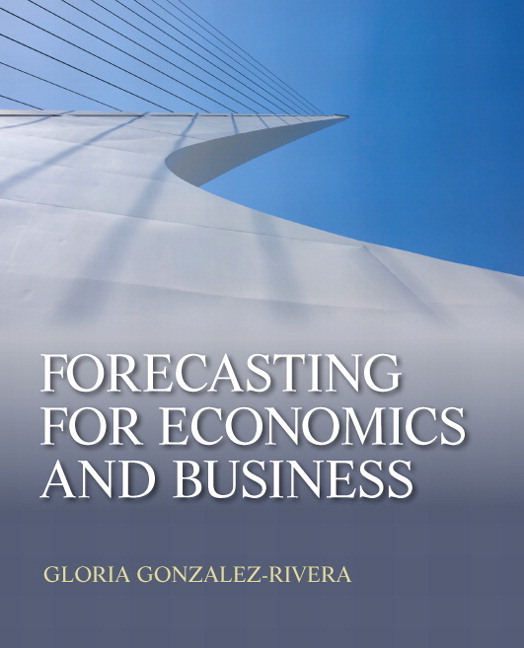 The following books use EViews to generate tables, graphs and examples. EViews routines for selected examples may also be provided in the book. Eric Ghysels and Massimiliano Marcellino (2018). 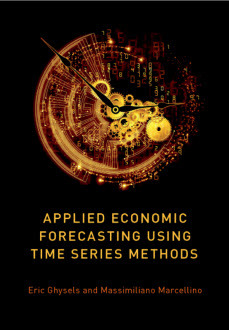 Applied Economic Forecasting using Time Series Methods. (626 pages - ISBN: 9780190622015). (396 pages - ISBN: 13: 978-8899902049). Dimitrios Asteriou, Stephen G. Hall (2015). Applied Econometrics, 3rd Edition. Palgrave MacMillian (552 pages - ISBN: 13: 978-1137415462 Paperback). Brooks, Chris (2014). 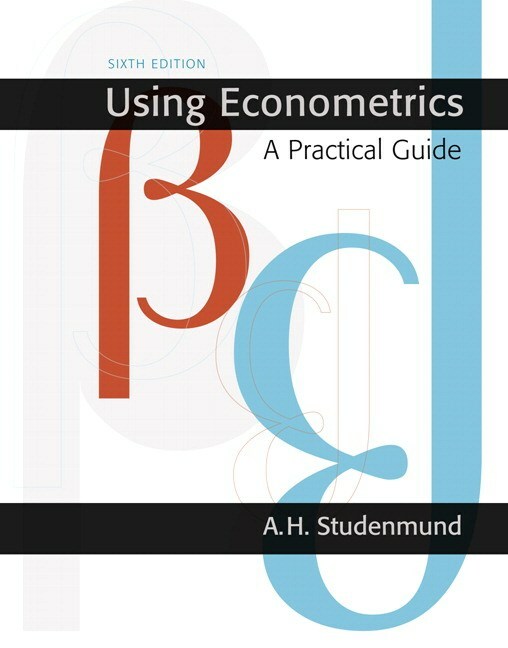 Introductory Econometrics for Finance. Cambridge University Press (740 pages - ISBN: 13: 978-1107661455 Paperback). Godley, Wynne and Marc Lavoie (2012). 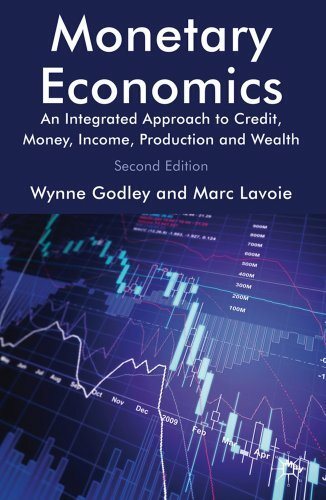 Monetary Economics: An Integrated Approach to Credit, Money, Income, Production and Wealth. Palgrave MacMillian (ISBN 978-0-230-30184-9 (Softback)). EViews examples. Vogelvang, Ben (2005). 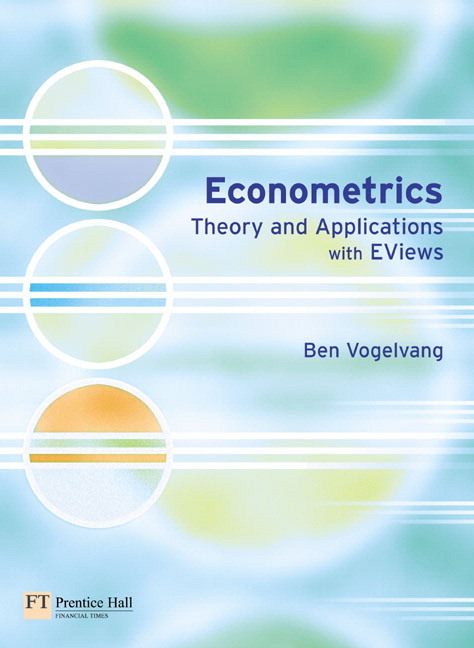 Econometrics Theory and Applications with EViews. Pearson Education (363 pages - ISBN: 0-273-68374-8). Seiler, Michael J. (2004). 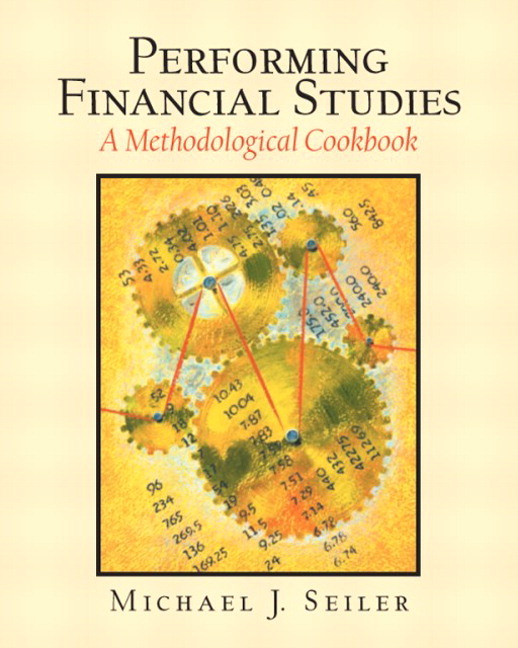 Performing Financial Studies: A Methodological Cookbook. Prentice Hall (432 pages - ISBN: 0-13-047981-0). Favero, Carlo A. (2001). 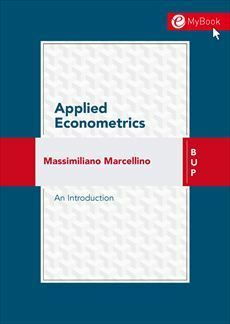 Applied Macroeconometrics. Oxford University Press (280 pages - ISBN: 0-19-877583-0 (Hardback), 0-19-829685-1 (Paperback)).